WEEI.com's Alex Speier is reporting that third baseman Rafael Devers will be promoted from the Dominican Summer League to the Gulf Coast League on Thursday. Devers was removed from Wednesday's DSL contest in the top of the ninth inning, fueling speculation that a promotion was imminent. Ben Badler of Baseball America first reported that Devers would be promoted two weekends ago, but in the meantime, Speier reported that issues getting Devers a travel permit to return to the U.S. were holding up the promotion. Some speculated that Devers would actually begin this season in the GCL, and his performance in the DSL shows that the 17-year-old is worthy of the aggressive assignment. In 28 games, Devers hit .337/.445/.538 with three home runs, walking more times (21) than he struck out (20). 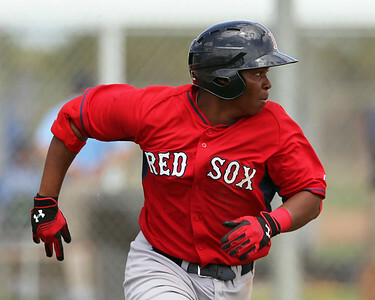 Although most numbers in the DSL must be taken with a large grain of salt given the widely varying level of competition, Devers's power production was rare for the level—his slugging percentage is the highest mark for an everyday player for the Red Sox since at least 2005, which is as far back as online statistics for the DSL go. Devers has perhaps the highest offensive ceiling of any player in the Red Sox system, and he has generated buzz ever since he debuted in the Fall Instructional League in 2013. He already boasts above-average power with the potential to develop plus-to-better pop. His great batspeed and advanced approach allow him to tap into that power in game situations. He is still developing as a third baseman, as he is presently adequate at the position, and given his large body, he may need to move across the diamond to first base as he fills out.